Heirloom beefsteak tomatoes are one of the most delectable things the warm summer sun can produce. This tomato variety is grown for its phenomenal flavor and impressive size. Their meaty texture makes them perfect for ripe tomato sandwiches or served sliced on their own. At Baywater Farms, we can trace the lineage of our heirloom beefsteak tomato seeds all the way back to Italy. We always pick when ripe so that you get the highest quality product that is usable immediately. Since these delicious varieties are grown from heirloom seeds, they grow to many different weights and sizes. Our heirloom beefsteak tomatoes are available in 10 lb. flats. When purchasing for cooking, keep in mind that 1 lb. of heirloom beefsteak tomatoes typically converts to about 1 ½ cups of chopped tomatoes. These tomatoes work perfectly wherever you would use other varieties of tomatoes, but they are stunning when served simply on their own. Slice up your heirloom beefsteak tomatoes and serve them on sandwiches or burgers. Pair with cheese and other fresh summer vegetables in a spin on caprese salad or cook them with olive oil and garlic for a vibrant fresh pasta sauce. Perfect heirloom beefsteak tomatoes are deep in color and firm when gently squeezed. Heirloom beefsteak tomatoes continue to ripen once they are picked, so this locally grown produce favorite can go straight from farm to table. 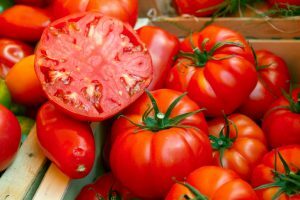 Store picked heirloom beefsteak tomatoes at room temperature indoors or in a shady area if you are cooking outdoors. Don’t refrigerate your tomatoes, or the juicy flavor will start to break down. To maximize the longevity of your heirloom beefsteak tomatoes, keep the caps and stems in place until you are ready to cook. Once you get your produce from our local family produce farm, you can enjoy their peak flavor for up to a week after harvest. Baywater Farms is passionate about cultivating non-GMO produce with love and care in the same soil that our great-grandparents tilled. On our sixth-generation family farm, all of our wholesale heirloom produce is grown using high-quality seeds that yield gorgeous, colorful, and delicious results. We use ecologically-friendly farming methods and are dedicated to preserving the provenance of our seeds, re-introducing historical crops, and supplying everyone in the area with locally grown produce with a conscience. You can find our fresh sustainably grown heirloom beefsteak tomatoes in national grocery store chains, produce distribution companies, roadside farm stands, local farm-to-table restaurants, CSAs, and farmers’ markets. To learn more about ordering our fresh local produce, click here. Our top-notch sustainably grown, non-GMO produce speaks for itself, and we know your taste buds will love to listen!